Request an access token so you can access account details for your merchant. Let your merchant know you’re running transactions on their behalf. Set the Event URL, which is the endpoint on your server to which AffiniPay sends notifications and event details, such as merchant application disposition. You must add your customer as an AffiniPay merchant. 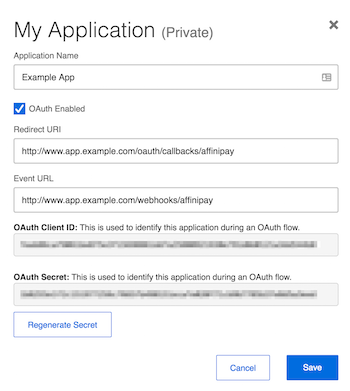 You’ll submit the application and obtain an access token using the OAuth 2.0 client credentials flow, which uses your partner OAuth application credentials. Note: The OAuth client credentials flow is not the same as the OAuth flow you use for the Connect button for current LawPay/AffiniPay/CPACharge merchants. The partner's application requests an access_token using partner OAuth application client credentials (ID and secret). The partner's application can store this token and use it to submit a new merchant application to AffiniPay. Before you can submit a merchant application, you must use the OAuth client credentials flow to request an access_token. This access_token will provide you access to the necessary API resources. This is not the same OAuth flow that’s used for the Connect button for current merchants. Use this access token to submit all merchant applications. Gather information from your customer through your application and build a merchant_application JSON object. Note: You should ask users to verify their information before submitting the merchant application. Business information that doesn’t match IRS records can have serious consequences for the merchant. 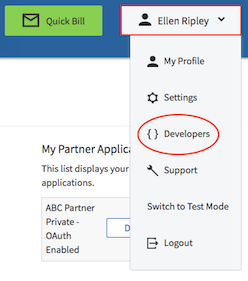 Use this jQuery plugin to capture an applicant’s signature and submit it in the merchant application JSON object. The plugin generates the value for the signature parameter in the required JSON format. See the plugin documentation for implementation instructions. Then, POST the merchant_application JSON object to the endpoint that corresponds to the product you’re integrating into your application. As soon as AffiniPay determines whether the application is approved or declined, we’ll send an event to the redirect URL you specified in your partner OAuth application. Configure a webhook to watch for this event. Event details include an authorization_code, which you’ll need to exchange for an access_token that will allow your application to access merchant account details and manage transactions on the merchant’s behalf. validate. Upon submission, the AffiniPay system will validate the provided values. If invalid, it returns an HTTP 422 code as well as additional validation messages. If valid, it returns an HTTP 200 code with a fake merchant_application: ID in the response body. After a short delay, a merchant.provisioned event will be fired with a fake authorization_code. fail. Upon submission, the AffiniPay system will return an HTTP 200 if validation is successful, but will fire a merchant_application.declined event after a short delay. This can be used to test a successful submission but a failure to underwrite. The short delays mentioned previously are for testing purposes only. In live deployment scenarios, these delays will be many hours (or days) long as the merchant application goes through underwriting. Since test mode doesn’t actually create a merchant application, merchant, or user in the AffiniPay system, the “fake” authorization_code cannot be exchanged for an access_token. Tip: You should use test mode until you’re ready to process live merchant applications. Processing merchant applications may require human involvement to finalize an underwriting decision. Send an email to the new merchant letting them know Quick Bill have been activated for their account.